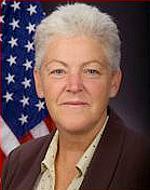 WASHINGTON, DC, March 4, 2013 (ENS) – President Barack Obama has selected Gina McCarthy to head the U.S. Environmental Protection Agency in his second term. In that position she would work closely with Obama to advance the climate change initiative he previewed in his State of the Union address. Since 2009, McCarthy has been serving as Assistant EPA Administrator for Air and Radiation. If confirmed by the U.S. Senate, she would replace Lisa Jackson, who stepped down in February 2013. 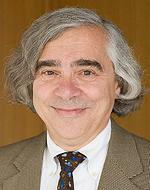 The President also named Dr. Ernest Moniz to replace Energy Secretary Steven Chu who is leaving at the end of March. “They are going to be a great team,” said Obama announcing the nominations this morning at the White House. Moniz is a nuclear physicist and professor at the Massachusetts Institute of Technology, who also serves as director of the Laboratory for Energy and the Environment and director of the Energy Initiative at MIT. He has been on the faculty since 1973, and has served as head of the Physics Department and as director of the Bates Linear Accelerator Center. Moniz is a current member of the President’s Council of Advisors on Science and Technology. He was named to the Department of Energy’s Blue Ribbon Commission on America’s Nuclear Future as of January 2010. Moniz has gone on record as being in favor of nuclear power, research into carbon capture and storage for coal-fired power plants, renewable energy and natural gas produced by hydraulic fracturing of shale rock. Moniz has expressed concern about climate change and supports funding research into low-carbon alternatives to fossil fuels. “She’s earned a reputation as a straight shooter. She welcomes different points of views. 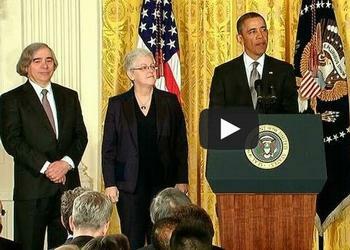 I’m confident that she’s going to do an outstanding job leading the EPA,” Obama said. In her 25 years in public administration, McCarthy has been an environmental advisor to five Massachusetts governors, including former Governor Mitt Romney. From 2004 to 2009 she was commissioner of the Connecticut Department of Environmental Protection. In this capacity she was instrumental in building the first market-based regulatory program in the United States to reduce greenhouse gas emissions from power plants. The Regional Greenhouse Gas Initiative, now implemented by nine Northeastern states, is a cap-and-trade program that auctions carbon emissions credits to reduce greenhouse gases. She is convinced that climate change is dangerous and must be averted. “Greenhouse gas pollution, through its contribution to global climate change, presents a significant threat to Americans’ health and to the environment upon which our economy and security depends,” she told the subcommittee. The EPA Office of Air and Radiation that McCarthy now heads is concerned with pollution prevention and energy efficiency, indoor and outdoor air quality, industrial air pollution, pollution from vehicles and engines, radon, acid rain, stratospheric ozone depletion, climate change, and radiation protection. The Office is responsible for administering the Clean Air Act and the Atomic Energy Act among other environmental laws. During the past four years, McCarthy led the development of national emission standards for the mercury discharged from power plants and helped create new greenhouse gas and fuel economy standards for passenger vehicles. The environmental community came out in support of these two nominations.